Set in Georgia and New York City in 1941 this heartbreaking memory tale of segregation and doomed love braids together Jim Crow, sexual hypocrisy, and the lingering shadow of a terrible crime. The world premiere of her first new play in a decade is directed by Evan Yionoulis who staged the award-winning TFANA production of Kennedy’s Ohio State Murders. Running Time: Approximately 45 minutes with no intermission. On Saturday, January 20 at 8:30pm where Pulitzer-Prize winning author and critic Margo Jefferson will lead a discussion with director Charlotte Braithwaite, and playwrights Lydia Diamond and Jackie Sibblies Drury. 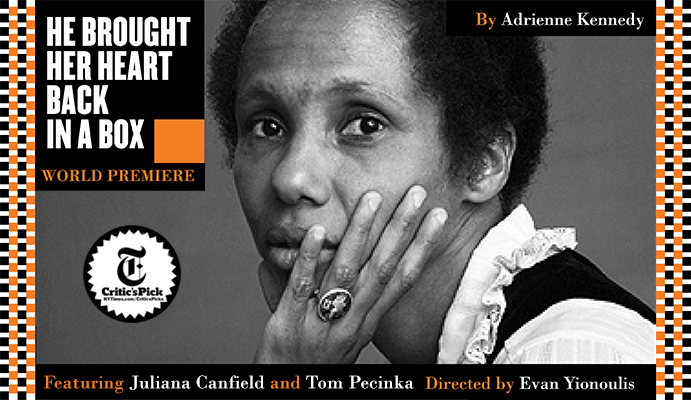 Each of the artists will speak about Adrienne Kennedy’s legacy and their unique relationship to her work. Click here to learn more and RSVP. Saturday matinee performances on February 03 and February 10. Join us for a party after the evening performance on Sunday, January 21. Every ticket purchased to that evening performance includes a drink ticket for use at the party. *Actors and Stage Managers appearing courtesy of Actors Equity Association.